Right, now we are getting very tactical. Not only can we build our amazing towns and gain lot’s of influence for ourselves, we can also play dirty! If another player seems to be advancing well and earning them self more influence than you, we can still combat this. By combating we will reduce their influence!! NASTY! 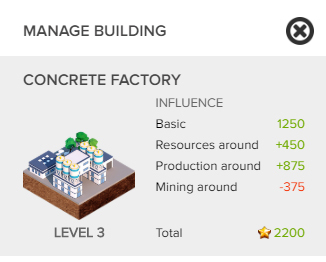 This is also a problem when building a Mega Mine as demonstrated here: This might be the easiest building to upgrade, but urgency is required to stop the influence losses! We can do this by purchasing land tiles next door to their building(s) and building an identical building to theirs, or a “negative” building. There will be certain combinations that will bring down the influence of a another building. i.e. 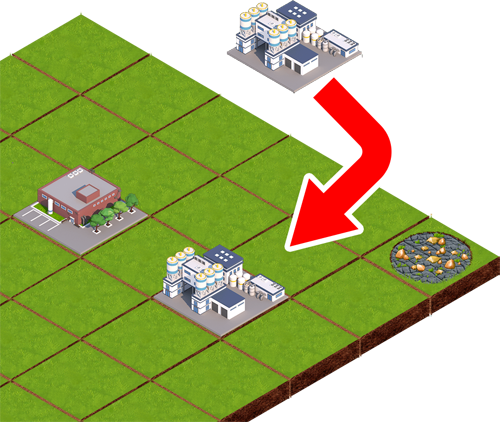 multiple Mining buildings reduce influence, or a mining build will reduce a residential buildings influence. 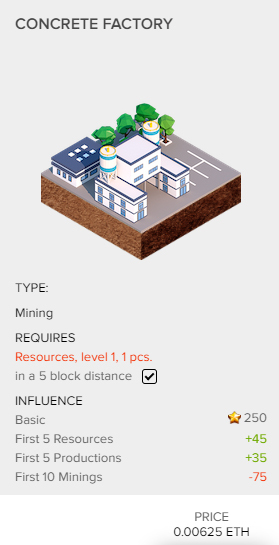 If you purchase any of the tiles within range of the resource block you can build your own Mine. This will create a negative influence for their mine (and yours). Although you won’t gain very much influence yourself, the reduction in influence for your opponent and your increased influence should gain you an advantage.